2005 Paso Fino Grand Nationals in Perry , Georgia. Her sire is the famous "El Duque" who was one of the best Paso Finos. El Duque produced many extremely high quality offspring; unfortunately this stallion passed away at a young age . His legacy lives on through his offspring. 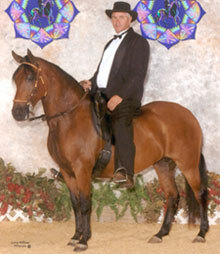 Competed and placed in Performance Mares and Performance Championship Classes in Florida during the 2005 show season. "Presidente AA" : Colt sired by Hussein foaled January 7th, 2003. "El Seductor AA": Colt sired by El Caporal AA foaled February 6th , 2004. "El Gobernador de MGM": Colt sired by Triunfo foaled August 23rd, 2006.